What If Steve Jobs Hadn't Returned To Apple In 1997? Today is Thanksgiving in the U.S. Traditionally we take stock of the things that we’re thankful for on this day each year. And I realized that one of those things is Steve Jobs. I’m thankful that he returned to Apple in 1997 and did the things he has done since. It wasn’t at all a certainty that he would ever return to the company that he cofounded two decades earlier. In fact, it was only luck and coincidence that pushed him back there. It was late December 1996. I was an associate at Wilson Sonsini Goodrich & Rosati, the largest and most well known law firm in Silicon Valley. I’d fought for my job there, and I was lucky to be in a small group of lawyers that worked on some of the hottest deals at the firm – Netscape public financings and acquisitions, Pixar’s corporate deals with Disney, and NeXT Software, among others. Steve Jobs ran Pixar and NeXT, and whenever he did something that needed a law firm, he called my boss. Well, my boss’ boss – Larry Sonsini. That month Larry got a call. Steve was going to try to sell NeXT Software to Apple . He’d presented to the Apple board of directors, and his characteristic anti-charm won them over. 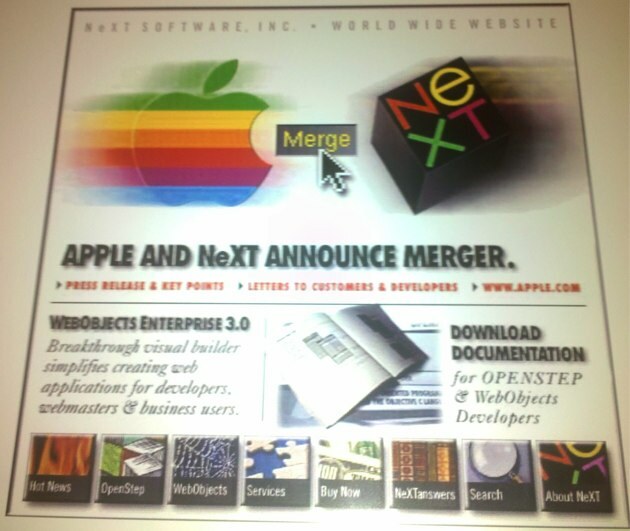 They’d shortly pay about $400 million to get NeXT, with Steve Jobs returning to Apple as an advisor. It wasn’t long before he took the CEO job and started a more than decade-long run of hit products that have disrupted the computer, music, television, movie and telecommunication industries. We worked night and day on that deal for six straight days, barely leaving the office and usually sleeping on the floor under our desks. When we were done, one of the partners drove me over to Steve’s house to get his final signature on the documents I remember stuttering in his presence about my first computer, an Apple II+. A few days later Steve left me a voicemail about an administrative issue. I saved that voicemail for years, until I left the firm. It was, all in all, a formative moment for me. And even today, not that many people fully realize how unlikely it was that the deal would ever happen. Apple was also negotiating with Jean-Louis Gassée to acquire his company, Be Inc. Be’s operating system BeOS was probably a better product fit with Apple than NeXT. Apple offered a rumored $200 million for Be, but Gassée held out for far more. And so Apple went with Jobs at the last minute. What if Apple had bought Be, and Steve never returned to Apple? What would the company, and our world, look like today? When Steve Jobs returned to Apple the company had just completed a fiscal year where they lost about $1 billion on $7 billion in revenue. The company was worth about $4 billion. Rivals like HP and Dell were worth about $62 billion and $8 billion, respectively. Today Apple is worth a staggering $184 billion on revenues of $36.5 billion and net income of $8 billion. The company is now worth far more than HP and Dell combined. Hewlett Packard is worth just $119 billion, and Dell is worth $28 billion. You could throw another Dell in there and Apple would still be worth more. In 1997 Apple had a snoozy product line that included the ill-fated Newton, the Performa, the Power Macintosh, the PowerBook a bunch of printers and a few servers. User dependence on desktop software meant that only the very loyal or the very strange used Apple’s products. Everyone else wanted a common desktop platform. Fast Forward to today. Apple has the sexiest products in the business: iMacs, Macbooks, iPhones, iPods and more. Even the Mac Mini has a place in my home, powering my television. In the last three months of this last year alone, Apple sold 3 million Macs, 10 million iPods and 7.4 million iPhones. But the hardware isn’t even the start of what Apple has done in the last 12 years. They’ve accelerated the pace of change in the music, film and television industries as well with the iPod and iTunes. And they’ve redefined the mobile phone with the iPhone. If Gassée, or anyone else, had become the CEO of Apple back in 1997, how many of these products would exist today? Would Apple have ever made the first iPod, entering into an already saturated MP3 player market in the beginning of this decade? How likely would the iPhone have been? And next year we’ll see an Apple Tablet computer. Does anyone think anyone but Steve Jobs would have pushed that product to market? I don’t think any of those products would have launched. Or if they did they would have been as notable as the MP3 players and phones launched by competitors like Dell and HP. Quick, who can name any of those products? Who’s owned one? Fortune recently named Steve Jobs the CEO of the Decade, and with good reason. Not only has Apple performed financially – it’s worth about as much as Google, and has a larger market cap than AT&T, HP, Intel, Dell and countless other huge tech companies. But forget all that. What would our world look like without him? We’d likely still be in mobile phone hell. Chances are we still wouldn’t have a decent browsing experience on the phone, and we certainly wouldn’t be enjoying third party apps like Pandora or Skype on whatever clunker the carriers handed us. Even if you use an Android, Palm Pre or newer Blackberry today, you must thank Apple for pushing open the doors to mobile freedom. Think back to the phone you had in 2006, and then tell me you don’t love Apple for the iPhone alone (yes, I’ve moved on, but the iPhone was the genesis). Steve Jobs was also the man who talked the major music labels into dropping DRM. He nearly single-handedly disrupted the entire industry. And it’s amazing how many laptops and desktops today mimic the look and feel of Macbooks and iMacs. Apple certainly hasn’t done everything right (MobileMe comes to mind, and I have had nothing but trouble with the Macbook Air). And their stance on the iPhone is irritating and, well, sorta evil. But all of that’s ok. Because without Steve Jobs’ Apple the world would be a less colorful place. The man is a living legend and deserves his place in history. This Thanksgiving, Steve Jobs is one of the things that I’m thankful for. And I bet you are too.